A completely CGI character is closer than we think (see Sean’s recent post on CG simians in the upcoming Planet of the Apes prequel). More screen time for Christopher Johnson and he would have been eligible for a best supporting actor award. Suggestion to the Academy: get ahead of the wave and announce two new award categories: Best Male and Female CGI actors in a lead role. What makes a good alien? Here are the six rules. Our Alien Academy Awards follow. On this first rather obvious point, the “go to” rule for most SF aliens is to show a horrific, gruesome entity (tentacles, slime, scales, chartreuse optics – pick a few) whose body language suggests a bionic blender. Clearly this approach is a slippery slope that ends at at best, with ignorable monsters (Cloverfield) and at worst, derisive laughter (Event Horizon). Only a rare few transcend this convention. Consider the Diva in The Fifth Element. To match her bizarre allure, Besson recorded her notes individually. Then he inserted them into the soundtrack faster than a human could sing them. A not-of-this world performance. An effective movie alien will be consistent with our imagination of what could exist. Suspending disbelief is important and some creative credibility helps us get there. The aliens can be sentient or driven solely by raw instinct. They can be subject to our laws of physics or outside them. For this point, scientific credibility adds authenticity and believability. Solaris springs to mind – a sentient planet that works on the astronaut’s consciousness through means totally unknown and probably incomprehensible to the movie’s humans. It calls to mind scientific speculation about how consciousness works at the quantum level. So many films only offer a one-note alien. We all know the drill: a killing machine of some persuasion or other. Rarely do we ever have a well-rounded alien: a character with a curious demeanor, a different way to explain existence, or body articulation that makes communication challenging. Enemy Mine, from director Wolfgang Petersen, was arguably the most serious film attempt to get under the skin (so-to-speak) of an alien. As excellent as it was, Jeriba’s rubber suit was really too hard to get past. (The predictable plot and uninspired script deserve some blame too). Film makes characters visually explicit. If an alien is to be truly successful, he (or she) can’t be so well defined. Some critical aspects need to be left unresolved and curious. So the successful director will spend a lot of time and imagination working against the nature of film itself. Geiger and Scott did it in Alien but I’m not referring to the Xenomorph, superb as it was. (There’s a better alien in the movie. Guess which one). Cutting down the alien’s on-screen time can force the audience’s imagination into play. The calabi-yau inspired slicers in Pitch Black – rarely seen clearly – are an excellent example. It works. Sometimes. This counter intuitive move – having the alien appear as a human – can be successful. Starman and The Day the Earth Stood Still gave us otherworlders made more compelling by actors who didn’t seem comfortable in their bodies i.e. Jeff Bridges, Michael Rennie, Keanu Reeves. (Bridges and Rennie were acting. Not sure about Keanu.) Watching the strange nuances of their behavior provoked our imagination. We sensed their curious apartness and suspended our disbelief. The same strategy failed miserably in Contact. After Ellie’s reasonable approximation of a wormhole journey, she meets an alien who has taken on her father’s form. With this failure of imagination, an opportunity to turn this story into a classic was lost. Movie aliens are more successful when they come with some baggage – cultural, behavioral, scientific – rather than the default “extermination” mode. Hence the more than 50 year appeal of The Day the Earth Stood Still. This inner alien self puts them and us on a similar footing even though we may be staring down the barrel of their far superior pulse cannon. Take Predator. What might have been just another first contact slasher film was elevated by an authentic alien way. For the better part of the movie, we see a filmy shape, moving impossibly fast in trees. Occasionally a translucent outline hints at something. The mercenaries read the clues. They finally work out that the Predator is just like them but with his own rituals. In the penultimate scene, two beings confront each other – sentient yes, equal no way. First contact at its most visceral. * For the purposes of this article, post-human is not alien so (unfortunately) no terminators or borgs. They are all pretenders when it comes to real aliens. If someone could supply a back-story that legitimizes borgs as alien, we will re-categorize them. So which movie aliens qualify as outstandingly out of this world? What other aliens would you nominate for these awards? 6EQUJ5 is the Wow! signal captured by The Big Ear radio telescope in 1977. It lasted 72 seconds. This length and the shape of its intensity graph may suggests a possible extraterrestrial origin. Despite strong efforts, it has not been detected again. There are no aliens in Event Horizon. Great job on this article, I love this kind of stuff. I agree with the majority of this article, but I have to disagree about Event Horizon and especially Contact. I thought for what they were going for, it worked very well. I’m surprised at not mentioning The X-Files though. They didn’t do much of anything new really, but they really popularized aliens and alien-like creatures, but then again I’m a huge fanboy for that show. Again, great job on the article. Technically the Spice Pilots and even the worm-like Navigator in DUNE are post-humans, both at different stages of spice-evolution. There are no aliens Dune, just different levels of humans. British Sci-Fi author takes the ‘divergent evolution of humans go on to essentially become so different as to be different species’ to radical extremes in his REVELATION SPACE series of books. I highly recommend book 2 in the series (essential a stand alone novel) called CHASM CITY. No Love for E.T. or Close Encounters in this article? I’ve always liked the ‘sentient slug’ approach taken in films like THE HIDDEN or NIGHT OF THE CREEPS or SLITHER. However – Best Post-Human….. my choice would be JC’s the THING. Interesting topic of discussion worthy of the podcast to be sure. I guess in terms of awards for CG characters from a performance perspective it seems there are two things: 1) the technical team that did the animation work (i.e. made the alien work from a design, lighting, shading, real-ish object in a real-ish world fashion). 2) the actor portraying the voice or providing the interactive element of the performance (I suppose this could be a person in the case of motion capture but also in terms of voice acting). So really since there is already a technical category; they might want to add a category for best performance in an animation? (this would be a catch all for voice acting and/or motion capture performance (mime work)). 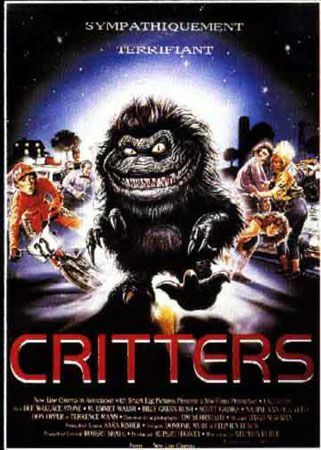 Where is the love for Critters? Nice one Kurt.. Good Job..
What happened to the watery tubey thing from The Abyss – that was a great alien! Thanks Curt! Great article. And great comments. Nice write-up Curt. Although my pick for best alien human, or at least one of them, would be Michael Rooker in Slither. Dunno if it fits the rules, but The Best Alien vocalist would probably go to Gizmo from Gremlins. And I agree with Big Hungry, best post human would be in The Thing. Notably the head with spider legs thing. Absolutely awesome. Alien Ensemble – Martians from Mars Attacks. They got personality, hehe. The Thing was an extraordinary Alien! Maybe should have won the non-sentient category. Hmm…. didn’t the Na’vi make their impact?